This node will query up a built in parameter by its name. If a list of names is supplied to ParameterNames input then it will return a nested list containing parameter values for each supplied element. This node will rename files in a specified directory based on a unique identifier. Identifier is a string that if contained in a destination file name will trigger this definition to rename it to a new name from a corresponding list supplied into New Names input. This node also requires a Boolean toggle supplied to RunIt in order for it to execute. This node will take an input of a list and concatenate each item from a list to create one string. It will use a user specified separator between each item on a list. Use Nested Lists to build complex strings for, let’s say, custom file names. This node will initiate a print procedure in Revit based on a few inputs. Views – This is a list of views (Sheets are views in Revit API) that will be printed. Combined File – is a Boolean input that when set to True will combine all printed files into a single PDF. Printer Name – Available printer names can be obtained from Local Printers Names node. So far I have only tested it with Adobe PDF. Print Settings – These are settings that will be applied to each sheet. Use Print Settings node to query up currently available user defined Print Settings. RunIt – its a Boolean input that when set to True will execute this node. Keep in mind that printing can be a time consuming operation hence I suggest to set this input to True only in strategically timed moments. This node will query up all user defined Print Settings currently available in the project. This node will query up all locally installed (excludes network) printers and will return their names in a list. 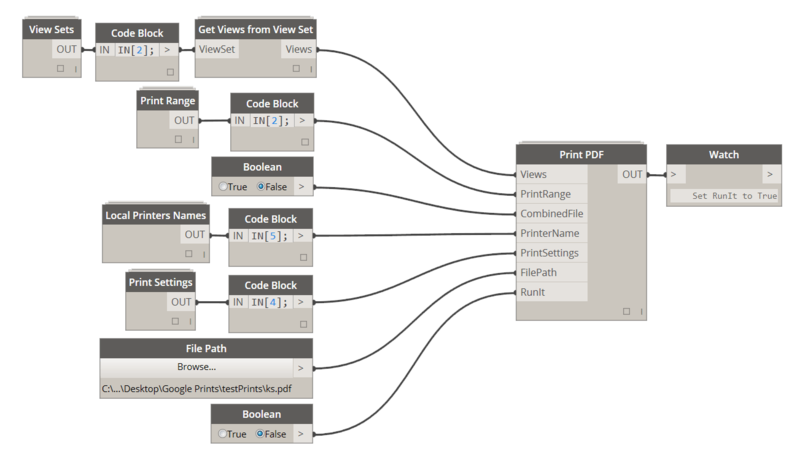 This node is useful when defining inputs for the Print PDF node. This node will query up the three available settings for Printing Range. This node will take an input of a View Set name (string) and return a list of Views/Sheets that are contained in that set. This node will query up all user created View Sets currently in the project. It will return just the name of the set as a String. This node will clear all Null values from a list or nested list. This node will perform a Mass Addition on a list or nested list. Is there an easy way to get a list of the built in parameters for a given element? Your GetBuiltInParameter node seems helpful, but if one doesn’t know the names of the element’s parameters, it becomes a little trickier to use. You can obtain a name of the BuiltInParameter using Revit Lookup tool. I don’t have a node that retrieves all available BuiltInParameters at the moment, but i will place that on my “to do” list. Thanks for the suggestion. Please see above. Also, there is now a node in archi-lab.net package that can do that for you. I am not sure that it will work on all element types, but let me know if it doesn’t and i will gladly add that functionality to it. It’s any possibility to download and use this stuff.?? All of the nodes listed here can be downloaded from Package Manager directly inside of Dynamo. Just go to package manager and search for “archi-lab” or “grimshaw” and you will have them all. Powodzenia! Konrad, I don’t know why it didn’t work with updating the package as usual, but I had to uninstall the archi-lab package and then install it again in order to see the new nodes! Some changes were made to the Package Manager in release 0.8.2 that were causing all sorts of issues. I don’t have control over that, but I did make the dev team aware of it. Thanks for using Grimshaw/archi-lab packages! All feedback is appreciated. 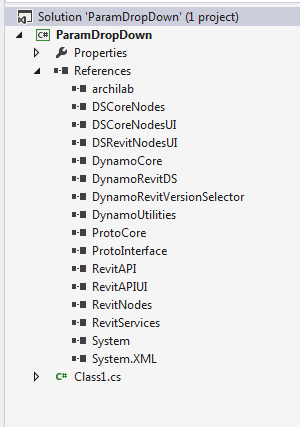 can you tell me, please, is there a way to import Dynamo/Revit libs in external IDE? For Python, I’m using PyCharm, and for C# I’m using VS. I’ve tried standard sintax for imports, but obviously I need to reference more libs than ProtoGeometry, ProtoInterface etc, and I don’t know which of them exactly. Hey Konrad! The get built in and set built in nodes are a very welcomed addition! Thanks so much. Any chance the code can be modified to handle elements? See my post on this page toward the bottom. the nodes are not handling family symbols when the built in parameter points to another element. Great suggestion! I am a little busy with other things at the moment but will add this to my “TO DO”. I am sorry that I can’t help right away. 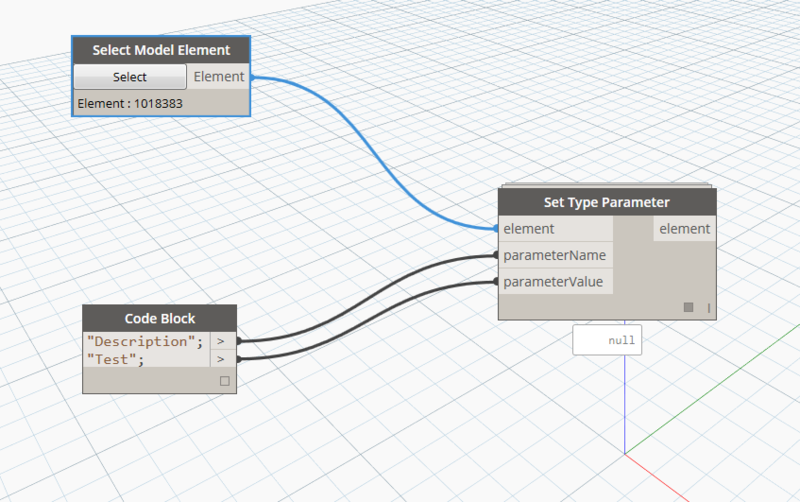 I cant get your “Set Parameter Type” node to work?! You are collecting all of the instances of the walls. That means that you are effectively overriding the same thing over and over again because once you modify a type parameter in one instance it updates all of them. What I am trying to say, is that you are wasting a lot of resources here, and probably causing Dynamo to misbehave. Try collecting just a single instance of each wall type and then overriding that. What is the latest version of archi-lab package that was built on 0.8.2? Luke, I have no idea. I think it’s maybe 2-3 versions back from whatever my latest one is. I just recently upgraded to 0.9.0.
i am trying to set the value of type Parameter of System Family “Wall”. i used your Note “Set Parameter Type”. i got null. what i am doing wrong? First of all, I have upgraded the archi-lab package to version 9.2 of Dynamo and tested it only on Revit 2016, so I cannot guarantee that it will work with earlier versions. Now, when you run into a node that returns a null, and you need to ask someone for help please provide enough information. In order for me to see what is going on, I either have to re-create that same error, or see what the error is. You node returned null. That doesn’t give me any clues as to what went wrong. Next time please double click that node, there will be a Python node inside, you can just copy that and paste it on the main canvas. Then you can re-wire it and run. It should return a warning or error, which is what I need. Anyways, this has been an older node and it had some stuff missing. I have fixed it. I will post a new version of archi-lab to Package Manager and it should work. thank you for your help. i upgrade Revit to 2016 and download Dynamo 9.2. I rebuild it in the same way you did in the “Capture-2.png” in your reply, but i did not work. enclosed i attached a screenshot. I would be grateful, if you make any suggestion to my problem. I have responded to your comments already. I said the node got fixed and that I will post it to a package manager but I have not done so yet. I will post it when I am ready with a larger release. Now, again I don’t appreciate you posting the same image again and again not doing any debugging like I suggested. Please read my comments again. 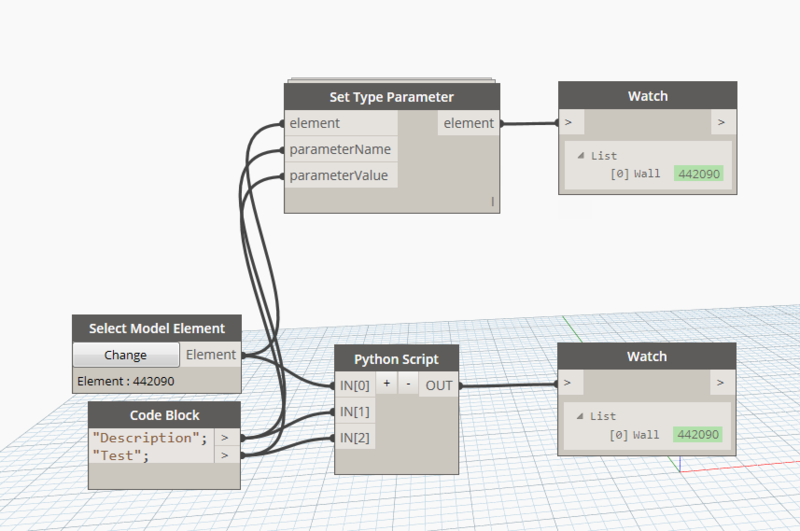 Thank you for all your work and help in Dynamo, it is really useful. Yesterday I download your package for the Rename File Node. I am trying to make it work, however I did not have any luck at all. I did a really simple test, in order to know if the node work in my PC, Dynamo version and so on. I saw in Dynamo Forum, people had the same problem (month ago), and I am not sure if they figured out how to make it work. Do you know if I am doing anything wrong? 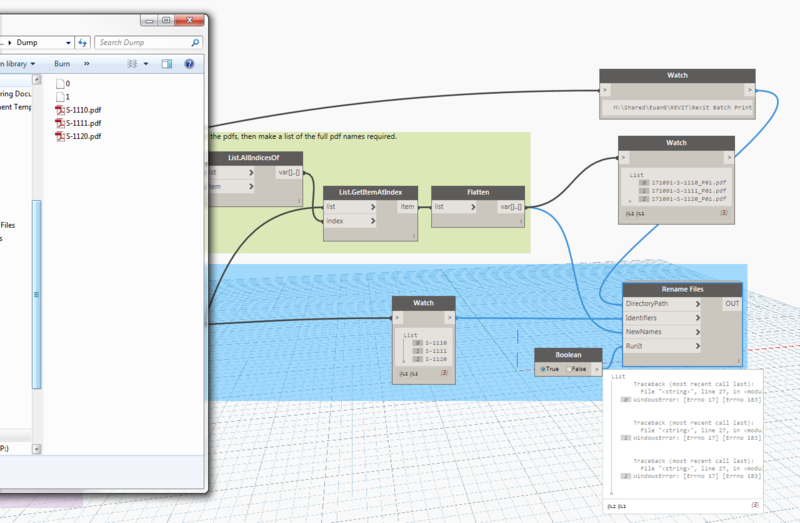 Is archi-lab package broken for dynamo 1.0 (revit 2015 & 2016)? 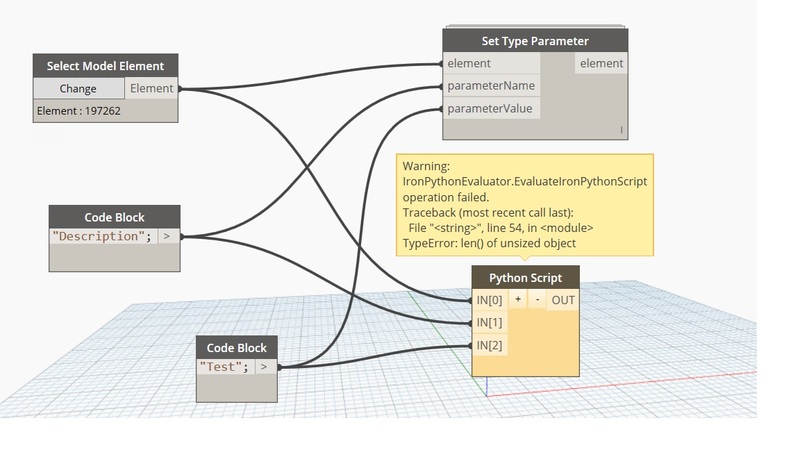 I simply can’t get any archi-lab stuff to show up in dynamo at all even though the package is installed. I’m trying to print a large amount of drawings (as a combined PDF) using the Print PDF node. When I run the workflow, it creates a PDF that is only the first page, and then throws an error saying “the iterator cannot proceed due to changes made to the element table in Revit’s database”. What does this mean? Thanks for the help! Sorry to bother you but I have been having trouble getting the Rename files tool to work. I am obviously doing something wrong but I can’t work out what it is!! in short, I have 5 pdfs in a folder, when I run ‘rename files’ it renames the first 2 files to ‘0’ and ‘1’ and the other 3 files do not change at all. the error message says ‘Traceback, line 27, cannot create a file when that file already exists’. Would you mind looking at the attached pic and let me know what I’m missing?